Have you ever found yourself playing "air guitar" to your favourite songs? Well now you could be doing it for real! 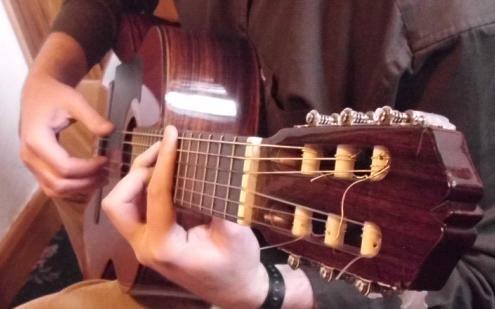 Or maybe you have already been playing the guitar for some time and would enjoy trying some more advanced music and techniques. If you live in Gravesend or the surrounding area and would like to learn from a very experienced and patient teacher, you have come to the right place. One Direction, Justin Bieber, Taylor Swift, Ed Sheeran, Kelly Clarkson, Adele, Artic Monkeys, Bruno Mars, Jessie J, Take That, Beyoncé, McFly, Lady Gaga, Snow Patrol, Boston, Avril Lavigne, Linkin Park, Jonas Brothers, Plan B, James Morrison, Red Hot Chilli Peppers, Blink 182, Green Day, Foo Fighters, Sum 41, Nickleback, Limp Bizkit, Muse, White Stripes, Nirvana, Metallica, Real Big Fish, The Rasmus, Queen, Thin Lizzy, Santana, Joe Satriani, Jack Johnson, Damien Rice and Carrie Underwood. My emphasis is for you to have fun while learning the guitar, playing your favourite music. Individual tuition tailored to you is a great motivator. Practice will be a pleasure! "Thank you for all your hard work preparing me for the Grade 8 Electic guitar exam. I am delighted with the result!" "Thank you so much for giving me such a wonderful gift (playing the guitar)..."